Hot this week: Don’t offer art for votes. Looted from the palace of the Oba of Benin by the British in 1897. The Maya site of Louisville in Corozal has been looted for construction material. A dog may have dug up the remains and they are going back to the First Nation. The sculpture had been in the yard for 8 years. Thieves pretended to want to buy a painting and stole a purse instead. “Flower Bomber” was stolen along with a rental truck parked outside the artist’s studio. Gardner Museum heist reward increase, will it help? There are clear similarities between the two works. Video shows two people stealing the artwork in the early morning. I doubt many will be rushing to buy this piece. Making an agreement with tribes for preservation, only to break it. Turns out the police doubt the high values that the owner placed on the paintings. They also feel it will threaten the sensitive natural environment at the site. He noticed a manuscript had been stamped with the seal of the Royal Library of Turin. Well, a piece of brain tissue. Ex property for Cornelius Gurlitt, selling to cover legal costs connected with the collection. The case concerns a 2001 theft and charges against those suspected were dropped. Cash was stolen from the museum cafe till during the evacuation for this suspicious fire. Art provenance specialist Richard Aronowitz speaks about his new novel. She posted about her loss on Facebook and someone spotted her works in a bin. Graffiti was written on a rock at 4000-year-old Clava Cairns near Culloden. The forger changed his name to Carl Feodor Goldie so he could legally sign “Goldie” to his forgeries. An argument that China’s loss from the Summer Palace looting is over stated. Following a tip that a group was trying to sell the idol. 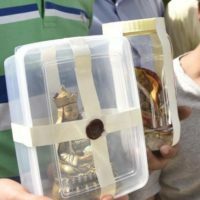 Police are saying that once every six months an idol is stolen and sold in the city. Some figures place it higher. Camera technician was arrested for stealing headbands from idols. This may indicate that missing museum items are still around Mosul. It was taken from the garden of the museum between the Yalvaç Court House and the Government Office. This could lead to condensation which may destroy the paintings. It is illegal to accept a gift in return for voting or not voting. Sorry all! Judge says that the public benefits of construction were substantial, despite opposition.